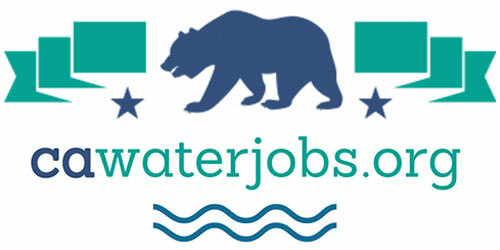 At the peak of the drought in February of 2015, the State Water Resources Control Board’s Division of Water Rights issued an informational order to 445 water right claimants in the Delta and its tributaries that required both riparian and pre-1914 claimants to submit information detailing the basis of their right to divert, point of diversion, and place of use for each claim, as well as the volume of diversions by month. 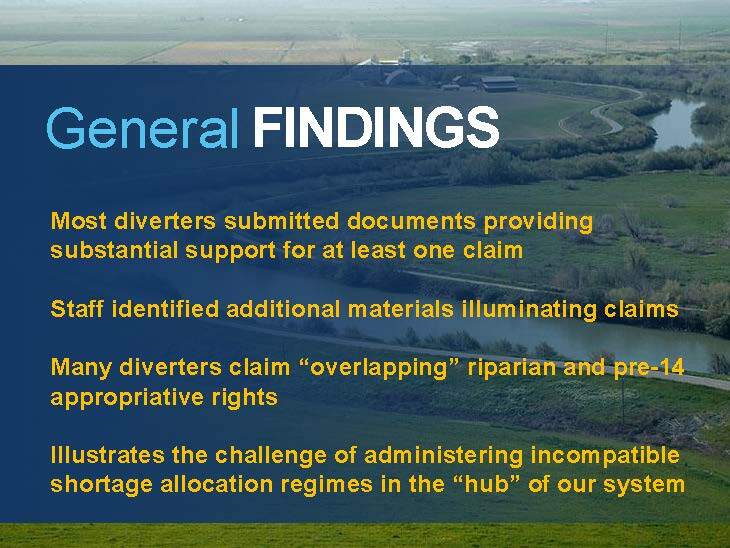 In total, the informational order requested information from 1,061 claims of water rights. The information obtained as a result was critical in managing the state’s water supply during the drought as the Division of Water Rights relied on the data received to clarify anticipated supply and demand for water and to help refine the their water availability analyses. 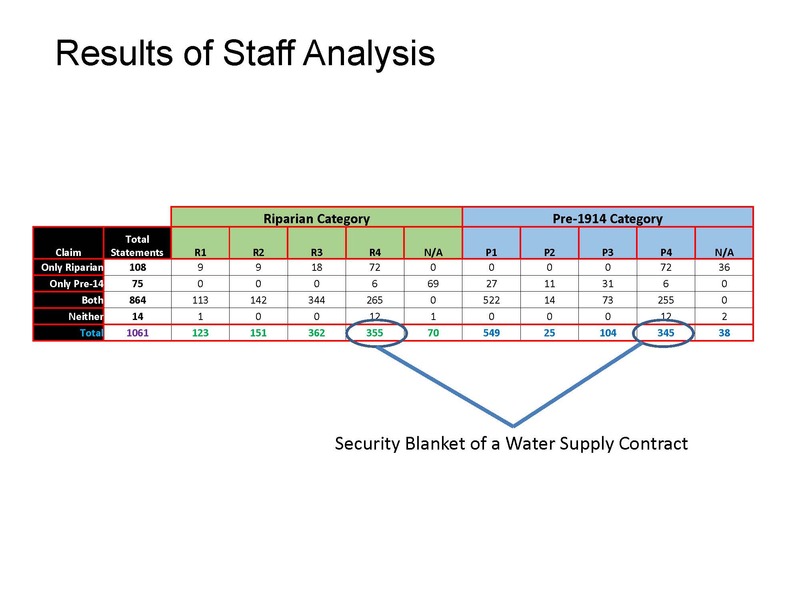 State Water Board staff recently released the additional information obtained from the respondents on the basis of their water right claims, including a spreadsheet summarizing the results of the Division’s review of responses by recipients of the order. At the February 20th meeting of the State Water Board, Erik Ekdahl, Deputy Director of the Division of Water Rights, and Michael George, Delta Watermaster, updated the board members on the findings and the recent release of the additional material. Erk Ekdahl began with the background on the need for the information order. In the spring of 2015, the snowpack was just 5% of historic average. Researchers at Stanford using tree ring and modeling data have estimated that the spring extent of the snowpack in 2015 was probably the lowest in at least 500 years with the period between 2013 and 2015 being the driest three year period in about 1300 years, he said. 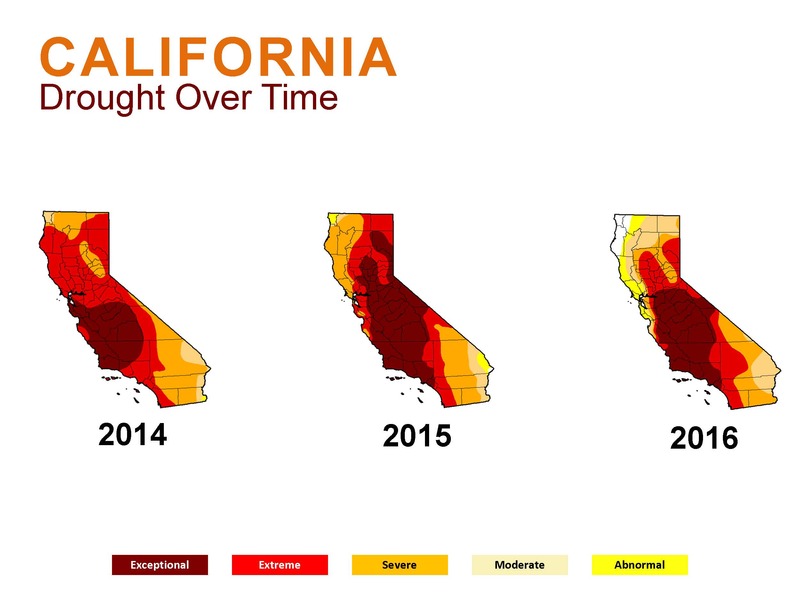 The drought peaked in 2015, and even though 2016 was a better water year, the state remained in drought, just trying to make up that deficit for the last couple of years that preceded it. “This is important for the Division and the Board in general because we’re responsible for managing the water rights and the beneficial use of those water rights and the way that we do that is by looking at supply and demand,” said Mr. Ekdahl, explaining that they use the information they have to estimate the water available and issue notices of unavailability. 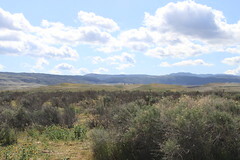 The Board issued the informational order in February of 2015 which applied to riparian and pre-1914 statement filers in the Delta and its watershed; it only applied to riparian and pre-1914 statement filers as the Board has better information for other appropriative post-1914 users, he said. 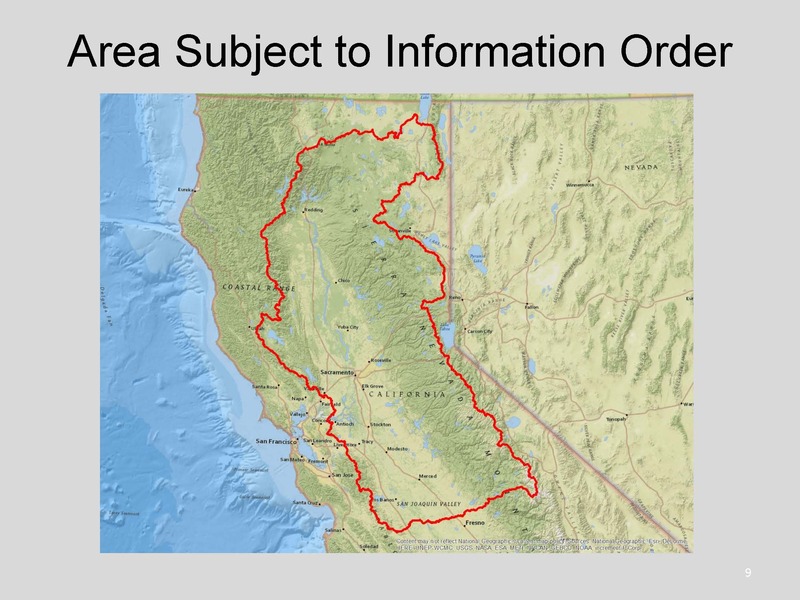 The order was distributed to 445 recipients representing 1061 claims of right which represents the top 90% of reported senior water use in the Delta watershed and its tributaries. The order requested information on the volume of diversions per month, the basis of right to divert, and the point of diversion and place of use for each claim, as well as documents that support the claimed water right to be submitted within 30 days of the receipt of the information order. He displayed a series of maps showing the diverters that the information order applied to, noting that there are a lot more riparian and pre-1914 diverters within the Delta than in the Sacramento and San Joaquin basins. The staff reviewed the information for the claim of water right, looking for whether or not there was information to support the claim. 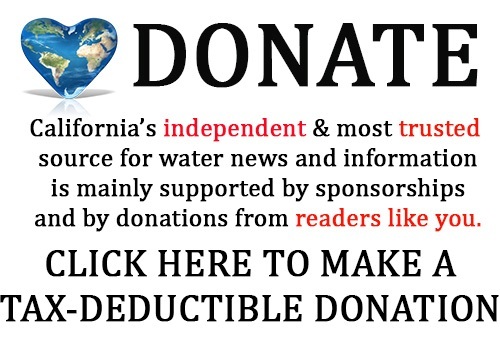 “One of the issues that we see when trying to determine the water availability analysis is if you say you have a pre-1914 right and conceptually if the board moved in to say that you didn’t have water available for diversion under that right, could you just then flip over to a riparian right and how would that affect our water availability analysis and the modeling that we had to do,” Mr. Ekdahl said. To illustrate the the difference between riparian and appropriative water rights, he presented a conceptual drawing. He noted that if a land parcel touches the waterway and the landowner diverts water from the waterway and uses it on the parcel that touches the waterway, that’s a riparian right; if the water is used in a parcel that doesn’t touch the waterway, in general that’s an appropriate right. There are nuances, he acknowledged. al Order sought “a copy of [the] notice [of appropriation] filed with the county, copy of property deed and all other information…pertaining to initial diversion and continued beneficial use of water. Mr. Ekdahl then presented some examples of materials that were submitted, noting many historical documents were received with some documents extending well back into the 1800s. State Water Board staff examined the documents as well as spent time looking for additional information to supplement the submitted materials; this process has taken about two years of analysis, and recently, a spreadsheet was released to stakeholders that summarized their findings. Category 1: Responses that do not provide information supporting all the elements of the claimed water right. Category 2: Responses that provide information supporting many, but not all, of the elements of the claimed water right. Category 3: Responses that provide information supporting each of the elements of the claimed water right. Category 4: Responses that indicate an alternative basis of right to divert water (usually a water supply contract) in addition to the underlying right. Mr. George pointed out that those that fell into category 4 have water supply contracts that act as a wrap-around, so even where there might be a weakness in some of the documentation for the underlying water rights, that doesn’t mean that there was an unlawful diversion or that there’s any reason to do a lot more analysis. 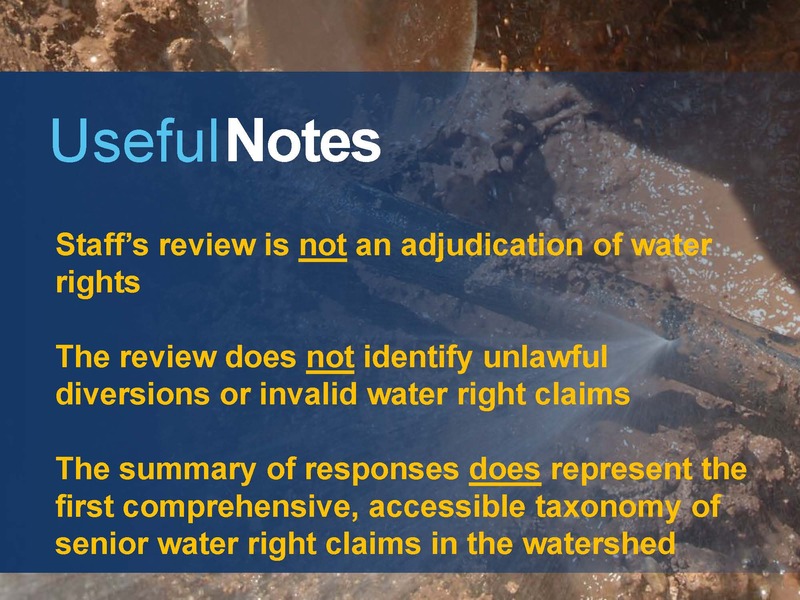 Mr. George pointed out that was not an adjudication of water rights, which can only happen before the courts and with due process; this was a staff review of documents that were provided by the water right claimants to show the basis on which they made their claim. He also noted that this review does not identify unlawful diversions or invalid claims at all. Mr. George said there is a website (more information here) for the public to review the data, which includes the GIS mapping, and is organized by island; it includes a chronological progression of maps where available. A spreadsheet is also available that identifying each of the water rights and the staff’s summary of the information provided. Board member Dorene D’Adamo asked Delta Watermaster Michael George to discuss the existing contracts in the Delta. To read the summary memo, click here. 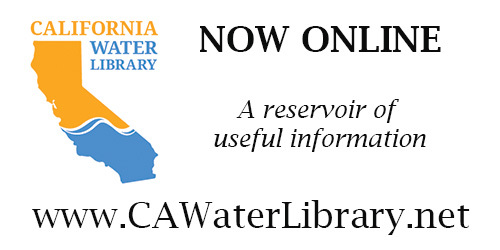 To access the spreadsheet, go to https://ftp.waterboards.ca.gov, Username: IORR-FTP, Password: AccessIORR Once logged in, click on the “Documents” folder. Double click on “Statement Analysis Master” to download the spreadsheet.